More than 500 people took part in the Aberdeen Culture Crawl for the Maggie's centre in the city. A unique charity walk through the streets of Aberdeen has raised £100,000 for north-east cancer sufferers. More than 500 people took part in the second annual Maggie’s Culture Crawl last month. 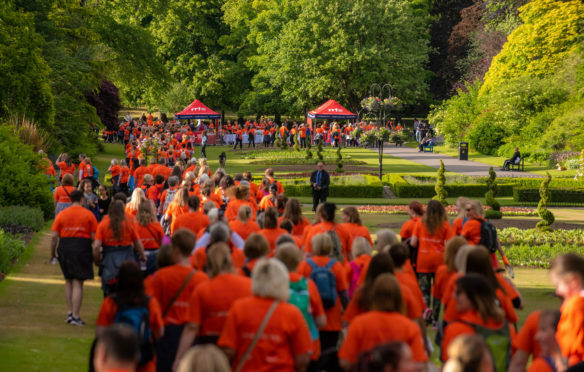 The 10-mile sponsored walk took participants around a series of the city’s cultural hotspots, rewarding them with food, drink and entertainment along the way. All of the money raised has been donated to the Aberdeen Maggie’s Centre, which offers emotional support for people with cancer and their family and friends. The event was the second-largest in the charity’s history, beaten only by a walk in London 14 years ago. Mrs Cormack added: “The fact that in just two years Aberdeen’s Culture Crawl has grown to become the second largest in the UK is a real testament not only to the cultural vibrancy of our city but most especially to the generosity of people in the north-east.